In the wake of last summer’s droughts and wildfires that forced the government of British Columbia to impose strict water restrictions, it came to light that the province didn’t have a good understanding of the underground water supply it was attempting to regulate. 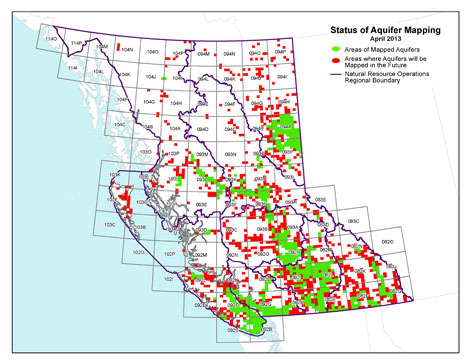 With an estimated “several thousand aquifers” in the Canadian province, of which only 1,110 have been mapped, it is not surprising that the ministry could not detail the state of their groundwater supply. Facing a similar challenge of quantifying its existing water resources, California turned to the skies for help. The state’s Department of Water Resources with the assistance from NASA’s Jet Propulsion Laboratory, is now using satellite imagery to identify areas with potential groundwater issues by looking for areas where the land is sinking faster. Satellite imagery data is collected ever one or two months and after analyzed, can detect changes in the surface level and shape within an accuracy of a few centimeters. While satellite imagery is suited for wide area monitoring, sensor-based monitoring is still the technology of choice for many organizations looking for water monitoring in local areas. Bentek Systems, an ORBCOMM solution provider, recently implemented a real-time, satellite-based solution for an energy company that needed to monitor aquifer levels from its remote groundwater monitoring wells. According to Ben Yee, President at Bentek Systems, the company used to charter a helicopter every three to six months to manually check water level information collected by data loggers. Since groundwater monitoring wells are located in difficult to access muskeg, access by means such as tracked vehicles was too time consuming. Bentek Systems offered the energy company a solution that not only eliminated the need for field personnel to manually collect data, it also provided data in real-time and reduced transportation and labor costs. The solution used their SCADALink SAT100 product which is a low power satellite SCADA device that provides modem, RTU, and alarm callout in a single device. It is designed for remote SCADA communications and monitoring of RS-232/RS-485 serial devices such as flow computers, RTUs, PLCs, and power meters that are inaccessible by cellular communications. The solution periodically measures water levels and sends the data four times a day using the IsatData Pro satellite M2M service to Bentek Systems SatSCADA web-based application. According to Yee, the benefits of the solution extend beyond eliminating the need to have personnel going to the field to collect data. “Real-time monitoring eliminates the scenario of missing data, which can be detrimental for any organization that relies on water as a critical resource,” says Yee. The real-time accessibility to data means the energy company can react to sudden or unexpected changes in water level in a timely manner. They also know if the data collection equipment is not working since water level updates are sent at a regular interval.